HCM City (VNA) – Ho Chi Minh City is ready to share experience and enhance all-round cooperation with Lao localities, Politburo member and Secretary of the municipal Party Committee Nguyen Thien Nhan told senior officials of the Lao People’s Revolutionary Party (LPRP) on August 4. Nhan made the remark while meeting with a visiting LPRP delegation led by Kikeo Khaykhamphithoune, head of the LPRP Central Committee’s Commission for Propaganda and Training. He said the visit is made amidst the 55th anniversary of Vietnam-Laos diplomatic ties and 40 years since the singing of the countries’ Treaty of Amity and Cooperation. 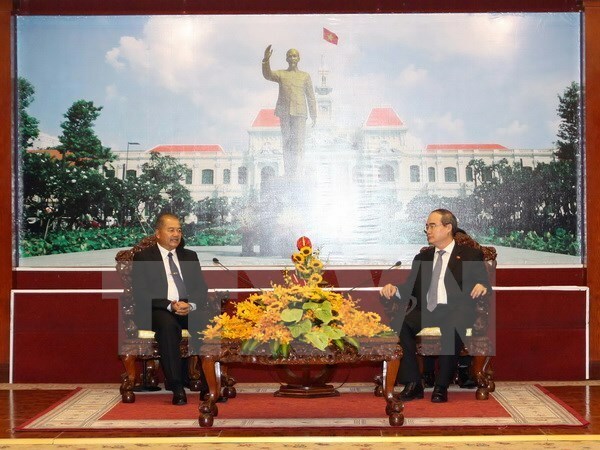 Their traditional friendship, special solidarity and comprehensive cooperation, including those between HCM City and Lao localities, have been nurtured by the two countries’ leaders and people and developing sustainably, he noted. Kikeo Khaykhamphithoune expressed his delight at the flourishing bilateral relationship, adding that cooperation is becoming more and more substantive in all fields and has generated significant outcomes. He voiced his belief that the Laos-Vietnam great amity, special solidarity and all-faceted partnership will continually thrive. Kikeo Khaykhamphithoune also informed the host official about the content of his delegation’s working visit to Vietnam, along with the outcomes of the fifth theoretical workshop on rapid and sustainable development recently held in Kien Giang province between the Communist Party of Vietnam and the LPRP. He said at the workshop, the two Parties’ officials shared much useful information in terms of both theory and practice, helping to fine-tune their respective Parties’ guidelines and policies.